Retail $19.99 SAVE 9% ! "Wonderful product, will buy again." Quick turn-around fun. Have been using the reloadable, which work just fine, but takes awhile to turn around to get to another launch. These are ready to go, and really have a lot of bang for the buck! Will buy again. Thanks. Blue Thunder- Produces a bright violet-blue flame with a minimum o exhaust smoke. These motors provide a higher level of thrust than White Lightnin or Black Jack motors of the same total impulse. The F32-4T is most likely one of my favorite F class motors. Very loud, and very fast as well. 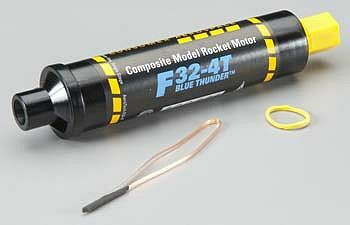 I have used this motor twice so far, once in an Aerotech wart hog, and once in an Estes red flare. Both were excellent flights and i would recommend this motor to anyone who has a rocket capable of using it.